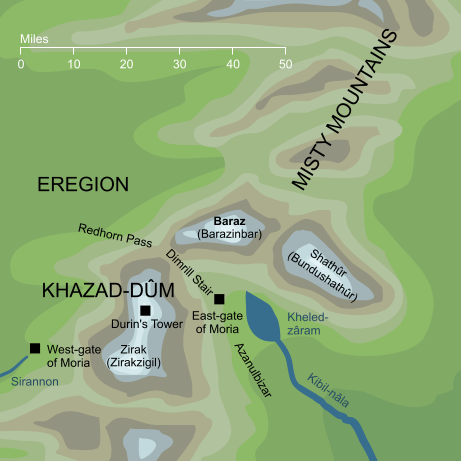 A shortened form of Barazinbar, the Dwarvish name for the northernmost of the three Mountains of Moria. The full name Barazinbar comes from elements baraz, 'red, ruddy' and inbar, 'horn', so naming the mountain simply 'Baraz' would be to call it 'red'. The same element made its way into the Elvish and Common translations of the name which were Caradhras and 'the Redhorn' respectively. Both of these names are direct translations of the full Dwarvish Barazinbar; the equivalents of the shortened form Baraz would have been Caran and simply 'Red', but there is no record of either of these alternative abbreviations being used. Tolkien doesn't explain Dwarvish pronunciation in any detail, so the placing of stress in Dwarvish names is necessarily speculative. An Elvish-speaker would naturally put the stress on the first syllable of the name, and we follow that convention here. Original content © copyright Mark Fisher 1999, 2001, 2009, 2013, 2018. All rights reserved. For conditions of reuse, see the Site FAQ.